This offer is the rental of the entire house 166 (two self-contained apartments) consisting of 4 bedrooms with a total of 8 beds and 2 living areas each with dining area, 2 kitchens and 2 bathrooms. The ground floor apartment offers modern furnishings and fresh colors. It offers on 57 square meters can accommodate up to 4 people. On request another bed (couch) can be provided for an extra person. The apartment has a double bedroom and another bedroom with two single beds. The kitchen has a ceramic hob and integrated oven, a refrigerator, a microwave and a dishwasher. Tableware is available for 6 people. The living area leaves no wish unfulfilled. In addition to the large TV with satellite channels and Internet connection, you can relax watch DVDs, play Wii or via the mini stereo just listen to the music. An exciting day can be spent in front of the house or in front of the crackling fire at the best on the sun terrace. The 53 square meter apartment in the attic has two bedrooms each with a double bed and a fully equipped kitchenette. 4 people will find enough space for a few relaxing days. The aligned south-facing balcony invites you to a leisurely breakfast. More space, z. B. for sunbathing or barbecues, offers the patio behind the house. Evening, after a day of sightseeing, you can make yourself comfortable on the sofa in front of a log fire inside. The living area is further equipped with a large TV with satellite connection, an Xbox, a DVD player and a radio tower and stereo. We are happy to provide a charcoal grill with charcoal, lighter and barbecue tongs for a fee. Am Silbersee Ferienwohnpark there are also other possibilities for grilling. The crickets in these places must be reserved at the party in advance and a fee to obtain a suitable grill for barbecues. - 2 lawn at the lake with sandy beaches. The lake is monitored during the summer and in good weather from the DLRG. The opening times of the leisure activities are dependent on season and weather. Usage and admission fees are not included in the booking price and must be requested and paid by the respective providers. The mentioned sports and leisure possibilities are all by car in max. 30 minutes away. In the wider area to there are many more sports and leisure activities. Simply ask us, if you are looking for more challenges or a preferred activity is not included. A variety of regional events lend themselves to a trip. For the selected travel period, we are happy to assist you in the search for an event. Wir hatten diese tolle Haus über Silvester für ein 5 tägiges Familientreffen gemietet. Trotz großer Personenzahl und vielen Kindern hatten wir ausreichend Platz. Im Haus war alles vorhanden, was man benötigt. Der Vermieter war immer erreichbar, sehr nett und hilfsbereit. Es hat uns an nichts gefehlt, wir hatten einen wunderbaren Aufenthalt und kommen bestimmt mal wieder. Ein schöner Aufenthalt, das süße kleine Häuschen ist mit allem ausgestattet was das Herz begehrt. Sehr nette Vermieter! Wir kommen gerne wieder! 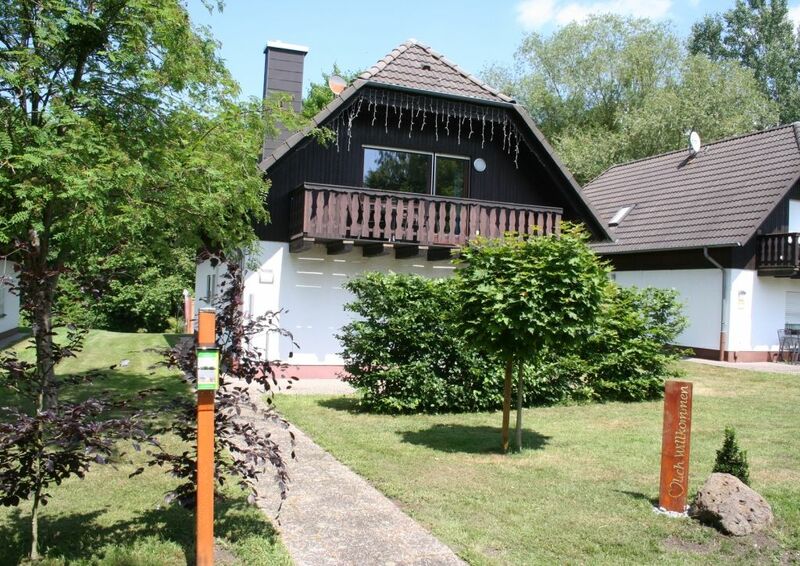 Wir haben uns sehr wohl und gut aufgehoben gefühlt, schönes Haus in einem sehr schönen Ferienpark, top ausgestattet, alles für den täglichen Gebrauch vorhanden, sehr sauber, sehr nette Vermieter, großer Kinderspielplatz am See, schön zum spatzieren gehen. Wir hatten einen super schönen Aufenthalt. Das Haus war in einem sehr guten Zustand und es war alles vorhanden was man benötigt. Sehr gut ausgestattet und sauber. Gut sind die 4 getrennten Schafräume mit guten Betten. Balkonausstattung und Kinderspielzeug. Die Endreinigungsgebühr in Höhe von 75,00 Euro ist vor Ort in bar zu zahlen. Bettwäsche und Handtücher sind im Mietpreis nicht inbegriffen, können aber bei Bedarf zur Verfügung gestellt werden. Einmalig fallen pro Person und Aufenthalt für Bettwäsche und für Handtücher 8,00 € an. Die Kosten werden vor Ort erhoben.